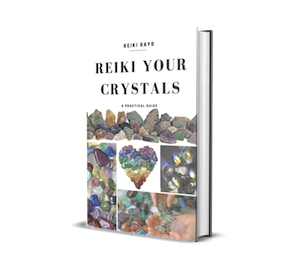 Crystal healing and Reiki both are two different healing modalities and yet both go together hand in hand. When Reiki and crystals are combined for healing, the result is magnificent. Having crystals along while healing with Reiki energy is like having an extra pair of hands. Since learning Reiki, I have developed a great liking towards. I have to strictly stop myself from purchasing any and every crystal I come across. Some crystals resonate with me so well as if they are just meant for me. Just holding some crystals in palms starts vibration in third eye. Having bought lots of crystals, next thing is to take care of them. Cleansing crystal is the most important thing to do before a healing session, setting a grid or programming for any other use. Those who are new to crystals may start wondering why crystals need cleansing. I asked hubby to give me his crystal pendant to cleanse. He said, “no its ok, it is not dirty☺”. Actually, crystals tend to absorb the energies around them. To diffuse the accumulated negative energy, we need to cleanse crystals. Cleansing removes all the previous programming too. So once cleansed, charge and program your crystals. Note: I would suggest using Reiki symbols and Reiki flow for every cleansing method. Reiki all the cleansing material used: salt, water, container, candle etc. Salt Water: Add salt to water and soak crystals for few hours in salt water. Not all crystals resonate with salt and water, so check before soaking crystals. Dry Salt: Place your crystals in a bowl of dry sea salt/rock salt/Himalayan salt. Make sure there are no left over salt particles once you are done cleansing. Running water: Hold your crystal under a tap, stream or any form of fresh running water. Imagine all the accumulated negative energy flowing away with running water. Earth: Place your crystals back to its original cradle. Bury your crystals in your garden, planter or backyard. Alternatively, gather some soil in a container and bury your crystal. After removing, wipe it clean and make sure no soil particles are left. Breathe: Hold your crystal in your palm and blow forcefully on your crystal. Imagine you are blowing a white light over crystals. Keep blowing till you feel your crystal is shiny or simply blow thrice with the intention to cleanse. Flame: Just rotate your crystal 7 times over a candle flame to cleanse it. You can even pass your crystal quickly through flame. Moon/Sun: This is one of the simplest and safest methods. Simply leave your crystals out in sunlight or moon light. Not all crystals resonate with sunlight so please check crystal’s properties before placing in sunlight. Smudging: Use sage or incense stick to cleanse the crystal. Simply pass your crystal through sage/incense stick smoke. Reiki only: Hold crystal in palm and draw CKR. Give Reiki with the intention to remove negative energy from the crystal. Bell or Singing Bowl: The vibration of the bell or the singing bowl has the power to cleanse your crystals. Just play the sound of bell/singing bowl near the crystals. Selenite: Selenite is considered as ‘Universal Stone Cleaner’. It does not need cleansing. Simply place your crystal over a selenite cluster or place selenite over your crystal. Alternatively, put all crystals in a box and program your selenite to cleanse all crystals in the box. Beach: Going to a beach? Take your crystal along and cleanse with sea water. Pendulum: Program your pendulum to cleanse the crystal and hold it over your crystal. Third Eye: Direct white light on your crystals with your third eye with the set intention. Crystal Clusters/Geode: Some crystals (citrine, carnelian, selenite) don’t need frequent cleansing. They can be used to cleanse other crystals too. Simply place your crystals on the geode or cluster. Plants: Lay your crystal besides your favorite flower or plant. Plants have the natural ability to transmute negative energy to positive energy. Pyramid dome: The shape of a pyramid itself is very powerful. Place your crystals under the pyramid dome. Pyramid dome neutralizes the accumulated negative energy of crystals when placed inside the dome. Flower essence: Soak flower petals of any flower in water for few hours. Fill this water in a spray bottle and spray on crystals. Again, for any of the above method, cleansing done with invoking symbols and infusing Reiki will optimize cleansing, charging and programing. Trust me, exactly what I needed. I was a little hesitant in soaking my Crystal in salt water. You provided lots many other options. Very informative. Thanks a lot !! It is disappointing when I click on the download on any of your articles that I get a pop up wanting my email address to sign up for your newsletter. If I put in my email address, it says my email is already on file. so how do I get a download? I love to cleanse my crystals under each full moon and the following sunrise.